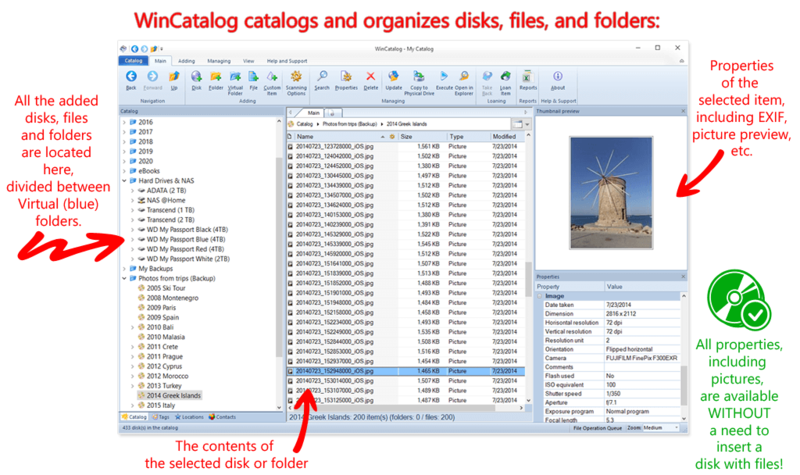 File Indexing Software WinCatalog 2018 will scan disks (HDDs, DVDs, and other) or just specific folders you want to index, index files, and create an index of files. WinCatalog will automatically index ID3 tags for music files, Exif tags and thumbnails for image files and photos, thumbnails and basic information for video files, contents of archive files, thumbnails for PDF files, ISO files, and much more. You can set an automatic update of an index, using command line and task scheduler. You can organize your files perfectly, using tags (categories), virtual folders and user defined fields, and find files in seconds, using advanced powerful search, including search for duplicate files and filtering search results, even without inserting or connecting disks to a computer! WinCatalog 2018 file indexing software is database driven. It uses the industry standard SQLite database engine in the core. This helps to index file collections of any size. No matter how many disks, files, or folders are stored in your collection – WinCatalog 2018 will handle all of them! 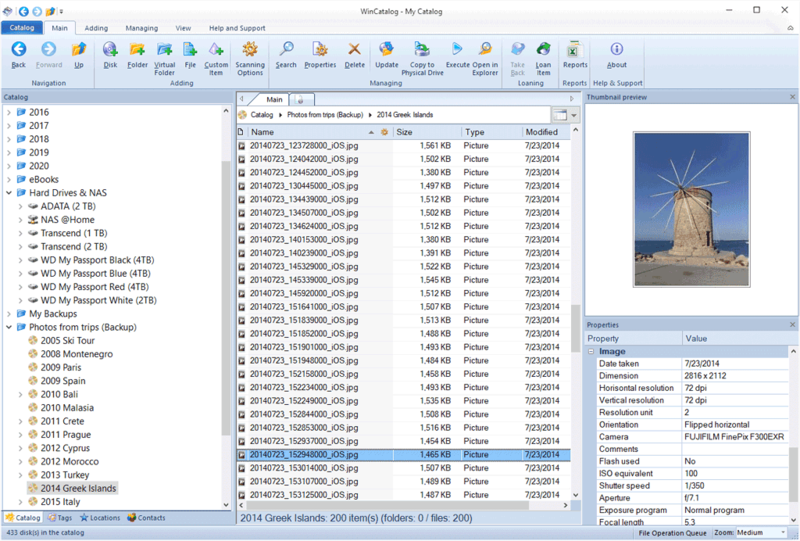 WinCatalog 2018 file indexing software can index picture thumbnails for most popular image types (like jpeg, png, bmp, and others) and video files, and store them inside an index. The thumbnail previews are available even without the link to the original files, so if you search for a photo, image or video, you can preview it to find a specific original disk quickly! WinCatalog 2018 file indexing software fully supports Unicode. No matter in what language your disks, files, and folders are named. WinCatalog 2018 will correctly index all files. In addition to Contact manager and Keyword manager, WinCatalog 2018 has a new Location manager that helps to manage physical locations easier. You can add all locations, say “box 1” or “cd wallet 2” and associate every item in the catalog with the location. It will help to find files faster. WinCatalog 2018 file indexing software has a tabbed interface that allows you to keep several various search results simultaneously.